Serenity is six and a half months now! It’s been an exciting few weeks! Just today we went to a farm with Grandma and Grandpa. Farmor and Farfar, to use the Swedish. We had a great time! 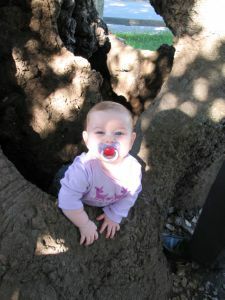 Daddy was extremely excited to see that Serenity climbed this tree! 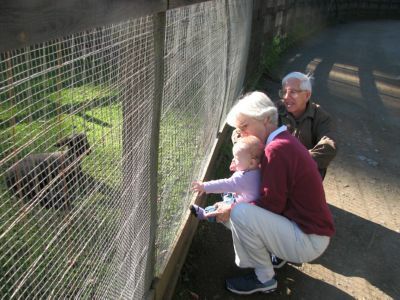 It was fun to see that she is interested in the animals! The farm was closed, so we just got to look through the fence at some sheep and a goat, but she did watch them! And she liked playing with the fence and seeing the other kids there. 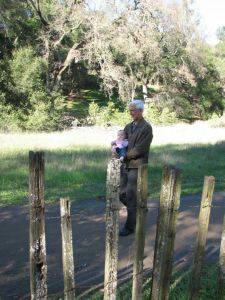 Grandpa carried her the whole mile out to the farm, and after a few minutes she and Grandpa were chattering away. So wonderful! We just joined Gymboree! It’s interesting having somewhere we have to be at a specific time. Getting her to nap before Gymboree is a challenge. She really enjoys it though. 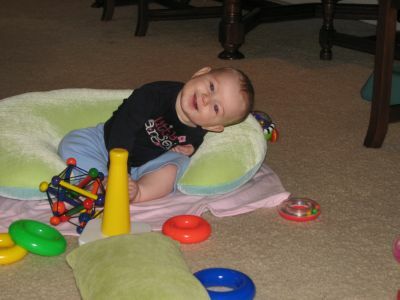 She likes to look at the other babies, and playing with all the brightly colored equipment is exciting. I like learning new songs and games to play with her. Keeps me from feeling like we get in ruts, always playing the same games. We still play them, but now we have others too. Like the Hokey Pokey! And it’s great to talk to other moms with babies of the same age. I learn a lot! 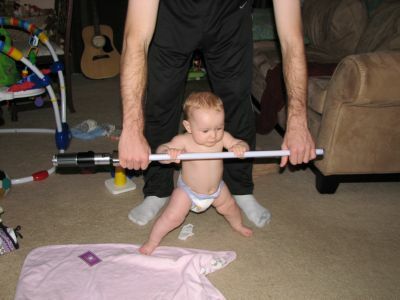 Serenity is getting really close to crawling I think. She’s started going backwards in the last few days, which is progress of a sort! 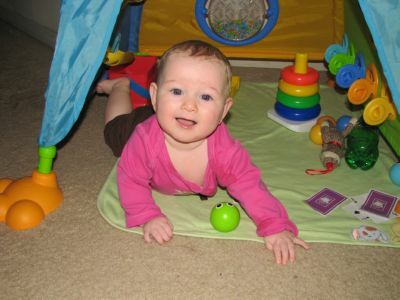 =) She enjoys playing on her tummy again, although you can tell when she gets frustrated that she’s not moving more. She’s so close! 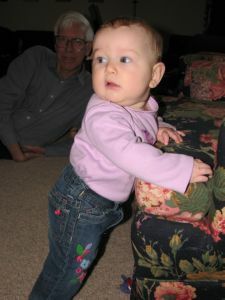 She is also standing when she holds on to furniture. She has no concept of falling though, she often just lets go and goes thump. I try to let her fall down sometimes so she knows the consequences of not holding on or balancing, but she is not scared of anything yet. 1/27 Serenity is doing the cutest little head tilt since Christmas. She leans her whole upper body to one side and tilts her head. It looks like she’s trying to get a different view on things. It’s adorable! Now, she’s started tilting her head to the right when we’re reading books to see the next page as I turn it! It’s SO cute! She’s really enjoying books now, we read four different ones before bed the other night and she showed no signs of boredom. She still adores Peeka-Who the most, but Barnyard Dance is a definite new favorite. I think she likes the animal pictures and sounds. And the sing-songy style of reading is fun. Especially when Daddy does the barnyard dance. She also loves the Pigeon book, Jamberry, Olivia’s Opposites, Ten in the Bed, and Snowy Bear. Serenity has been extremely talkative lately! She’s definitely babbling now, so she says things like Wa wa wa and Ya Ya Ya. I’m sure she’s said Da da da at least once, and I’ve heard her say Mmmms, but that’s usually when she’s eating apples. 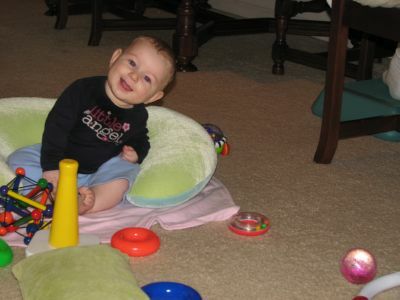 =) She also makes this funny little cooing noises. I’ll try and hunt up the videos and post them so you can hear her! She is definitely a talker.